Advent printers are manufactured for Currys and PC World but the ink cartridges they use are not always easy to come by. The Advent A10 and AW10 series of printers use a black and colour ink cartridge both of which have been increasingly more difficult to obtain. Generally, ink cartridges in Cork are easily bought either from an ink shop in Cork or online with delivery usually within a couple of days. The advent cartridges until recently were only available from the Currys or PC World shops but are now available from good online suppliers. Many people in Cork have bought these printers in recent years and have been delighted to learn that you can use the compatible version of the Advent ink cartridge without too many problems. 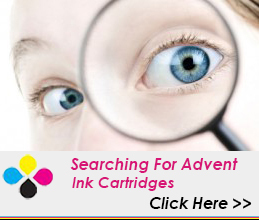 Any good ink shop in Cork will stock the compatible Advent cartridges but they can be delivered either next day or within a few days when ordered online. Because there are so many Advent printers about, they would be one of more popular ink cartridges in Cork making the demand for them quite high. Typically you could expect to pay around €21 for an original brand black ink cartridge and up to €35 for a colour cartridge. The compatible ink cartridges can be as low as €8.99 for a back and €13.99 for a colour cartridge excluding VAT. This is a saving of over 100% on the price of an original brand cartridge. The volume levels of ink are the same so it’s a really good deal but I am not sure if you would get this deal ink an ink shop in Cork – I suspect that these prices would only be available online. Of course you will need both Advent ink cartridges to be have a ink in them for the printer to work, it’s not possible to print if one cartridge is empty – for example if you just want to print black you will still need the colour cartridge to have ink in it. The printer, it seems, will still use a tiny amount of colour ink even when printing a black image or text. The Advent printers are reliable and a good buy from PC World and Currys. However, the availability of the ink cartridges from another ink shop in Cork is more of a problem and can mean that you are limited to where you can buy your ink.